All magnetized planets in our solar system (Mercury, Earth, Jupiter, Saturn, Uranus, and Neptune) interact strongly with the solar wind and possess well developed magnetotails. It is not only the strongly magnetized planets that have magnetotails. Mars and Venus have no global intrinsic magnetic field, yet they possess induced magnetotails. Comets have magnetotails that are formed by the draping of the interplanetary magnetic field. In the case of planetary satellites (moons), the magnetotail refers to the wake region behind the satellite in the flow of either the solar wind or the magnetosphere of its parent planet. The largest magnetotail of all in our solar system is the heliotail, the “magnetotail” of the heliosphere. The variety of solar wind conditions, planetary rotation rates, ionospheric conductivity, and physical dimensions provide an outstanding opportunity to extend our understanding of the influence of these factors on magnetotail processes and structures. 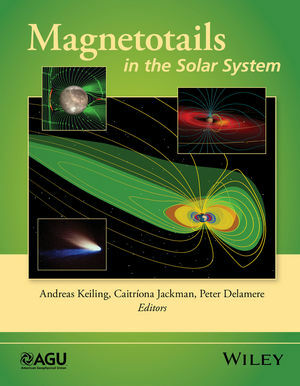 Collectively, Magnetotails in the Solar System brings together for the first time in one book a collection of tutorials and current developments addressing different types of magnetotails. As a result, this book should appeal to a broad community of space scientists, and it should also be of interest to astronomers who are looking at tail-like structures beyond our solar system. Andreas Keiling is an Associate Research Physcists with the Space Sciences Laboratory at the University of California-Berkeley. Dr. Keiling has held various visiting professorships. He has also served as lead convener for sessions at the American Geophysical Union, European Geophysical Union, and Chapman conferences. Catriona Jackson currently holds a Leverhulme Trust Early Career Fellowship and a Royal Astronomical Society Fellowship in the Department of Physics and Astronomy at University College London. Peter A. Delamere is an Associate Professor at the Geophysical Institute at the University of Alaska-Fairbanks.